Exciting new levels of love and joy, hope and humor are skillfully woven by master storyteller Jim Pappas, into this enchanting retelling of John Bunyan's immortal classic! Designed to return this spellbinding masterpiece of angels and giants, castles and dragon, to the fireside of the everyday reader. Includes original illustrated artwork. - Publisher John Bunyan's amazing Pilgrim's Progress is well into its fourth century of unparalleled popularity as the world's best-selling non-Biblical book in all history. 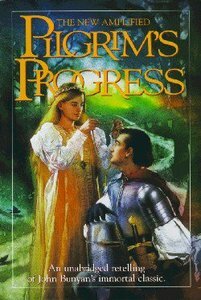 Now in modern English comes The New Amplified Pilgrim's Progress. All of the age-old spiritual treasures that have made John Bunyan's original the world's best selling non-Biblical masterpiece in all of history are now carried to new heights of power and clarity in this new enhanced version. While this is perhaps the most adventure-filled and user-friendly adaptation ever penned, yet it is totally unabridged and, excepting certain amplified scenes, remains strictly faithful to Bunyan's original storyline. About "Pilgrim's Progress (New Amplified)"
John Bunyan's amazing Pilgrim's Progress is well into its fourth century of unparalleled popularity as the world's best-selling non-Biblical book in all history. Now in modern English comes The New Amplified Pilgrim's Progress. All of the age-old spiritual treasures that have made John Bunyan's original the world's best selling non-Biblical masterpiece in all of history are now carried to new heights of power and clarity in this new enhanced version. While this is perhaps the most adventure-filled and user-friendly adaptation ever penned, yet it is totally unabridged and, excepting certain amplified scenes, remains strictly faithful to Bunyan's original storyline.